The National Carbon Cocky Award is judged each year during Carbon Farming Week. It was inaugurated in 2007 as a way to acknowledge pioneering Carbon Farmers and put a spotlight on new techniques for avoiding or absorbing Greenhouse Gas emissions. Finalists are thought-leaders of Carbon Farming. When the world’s leaders cannot agree, the people must lead. In their everyday working life Carbon Farmers point the way forward. They are our hope for the future. Winners will be announced at the Gala Awards Dinner, Dubbo RSL Club, 23rd October, 2012. • David Bruer and his son Michael look after 22 hectares of organic wine-grapes and a winery at Langhorne Creek. They have 8.5 hectares of vines and mandarins at Loxton and a further 26 hectares of vines at Eden Valley. Temple Bruer is producing preservative free organic wines and has two climate change wines. These are made from varieties that tolerate much warmer ripening conditions. • In an Australian first, his wine making operation at Langhorne Creek is a carbon-neutral operation. It was already Australia's largest dedicated organic winery. Now he plans to become carbon nuetral without the purchase of carbon credits. His Temple Bruer label the only winery in Australia to be both organic and carbon-neutral. • Bruer has started with a switch to lightweight bottles. The bottles weigh 360 grams instead of the standard 560 grams, so there is less carbon emitted during production and less fuel used in transport. "We shrunk our label by 5.1 per cent and situated it down closer to the bottom of the bottle. You can't really tell which is the lightweight bottle. We also put on a label saying clean and green lightweight bottle. • David Bruer looks forward to the day when he can sell soil carboncredits In 10 years to 2011 he has increased average soil carbon levels by 2% which translates into more than 10tonnesCO2-e/ha/yr. 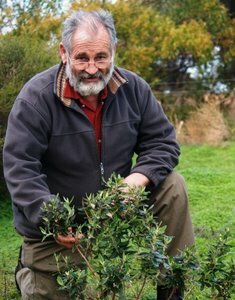 • He is maximising soil carbon through the use of organic compost. "Our soil carbon is much higher than our immediate neighbours. A soil analysis shows theirs is 0.4 per cent and ours is 1.7 per cent. We're achieved this by growing compost to grow a strong cover crop." The cover crop, a 50/50 mix of legumes and cereal, stands at 1.2 metres high. "We flatten it with a crimping roller to make a thick mat up to 50-75 milimetres thick. The worms love. It's a very good way to build up soil fertility and that's the key to a good agricultural system."